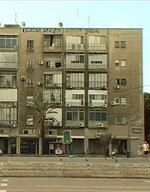 From Tel Aviv, a subjective portrait of the city. "I am Jewish because my mother's mother was Jewish. I am Jewish because, as my grandfather once told me, "Kaplan means Jewish". It's in the name. I did not know Israel, did not understand Israel: it was confusing and terrifying. Israel meant war, the conflict, images of disaster. Then one day, in Paris, I meet Nadav. He is Israeli. We fall in love and I understand that I have to know Israel if I am ever going to understand him. I go to his home, to Tel-Aviv. As I walk through the streets of the city I wonder if I can ever make it my own, my home. In order to protect myself I turn to the familiar, to what I know: the camera. I start filming from Tel-Aviv, searching for identity – the city's and my own."